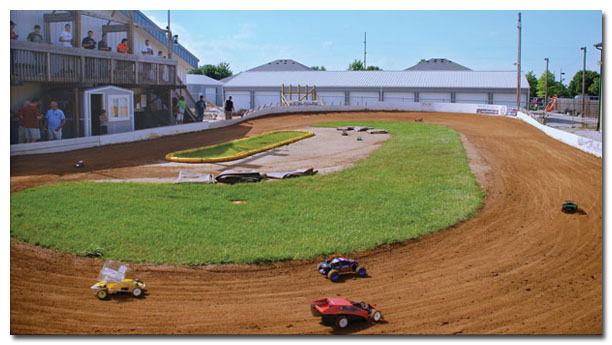 Located at the rear of K-10's Model Trains, Maryville R/C Raceway consists of a lighted dirt track with a 215’ banked oval. The driver's stand is 33' long and 8' high. The Maryville R/C Raceway uses two wire transponders only. Computerized scoring is accomplished with R/C Scoring Pro software and the AMB Lap Counting System, which accepts personal transponders. Saturday night racing starts at 6:00pm. All racing and practice is dependant on seasonal weather conditions. There are electrical outlets and picnic tables available for working on your cars. During racing hours the refreshment and car parts stand are open. The cost for racing is $15 for the first vehicle and $10 for each additional vehicle, and includes practice time prior to racing event. Practice session only (no racing) is $5 per person per day. Race winners will receive prizes and points toward seasonal winners in multiple car classes. Spectators are welcome during racing activities, but please do so at your own risk. Small children must be kept under adult supervision at all times. Maryville R/C Raceway Rules, Regulations, and Procedures are listed on the rules page and on the reverse side of each driver registration form.